Use this resource to model isometric drawing or let children practise with it on a computer or tablet. 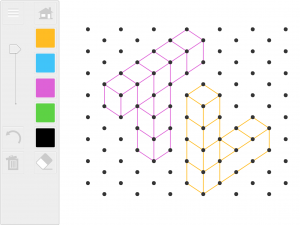 Just drag from one dot to another to draw in different colours or erase lines. An undo button is also useful. The dots themselves can be faded out to be less dominant. Go to isometric drawing teaching resource. This resource is also part of the Numeracy Basics app downloadable on the iOS app store.